This enables you to extract SERP Visibility metrics automatically from AWR projects and upload them directly to your GDS reports. Requirements on the specific metrics and dimensions made available came from Ian Macfarlane, Head of SEO, and the team at Digitas UK. They’ve been working with us for a few years, and brought a strong contribution to this project drawing a clear picture for an efficient data integration. 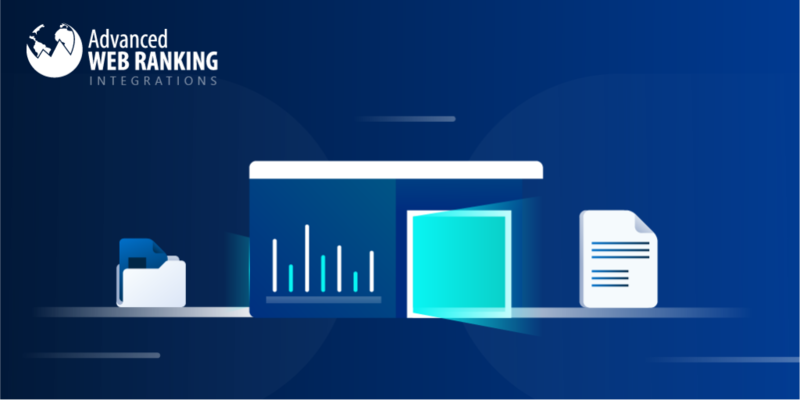 In this article, you’ll learn how to set up the Data Sources, what are the differences between the Report Types available from AWR, and you’ll also get a peak at some report samples that were built by awesome AWR customers who were on board of our User Testing program. So let’s see how it works! The GDS connector is available through API. Hence it’s accessible to all AWR users with Agency subscriptions or higher, as well as to all subscribers of a yearly AWR plan. Project name (exact match) – this option is recommended for SEO teams that associate each customer to a single AWR project. Project name (partial match) – this option is dedicated for teams that manage customers with multiple Business Units in separate projects, and need to report visibility data under one roof. Project tag – this option is built for SEO directors, fetching data from multiple AWR projects that are grouped by tags for each team in charge. When it comes to mapping, it’s important to define the aggregation method for each metric exactly as you want the values to be further shown in the GDS report. Average – used for Visibility percent, Click share and Average rank. Sum – used for the Visibility score, Estimated visits, as well as the rank position distribution and changes metrics. For example, if you have a weekly updated project and look at a GDS report across 30 days, the Average metrics will show values computed as arithmetic average across the update dates available within this time interval, while the Sum metrics will show values that add up together the numbers recorded on each of the updates available. Visibility date comparison – for recurring reporting, showing visibility at the current date (or any other date you prefer) as compared with another date in the past. You can find a report sample of this visibility report here. 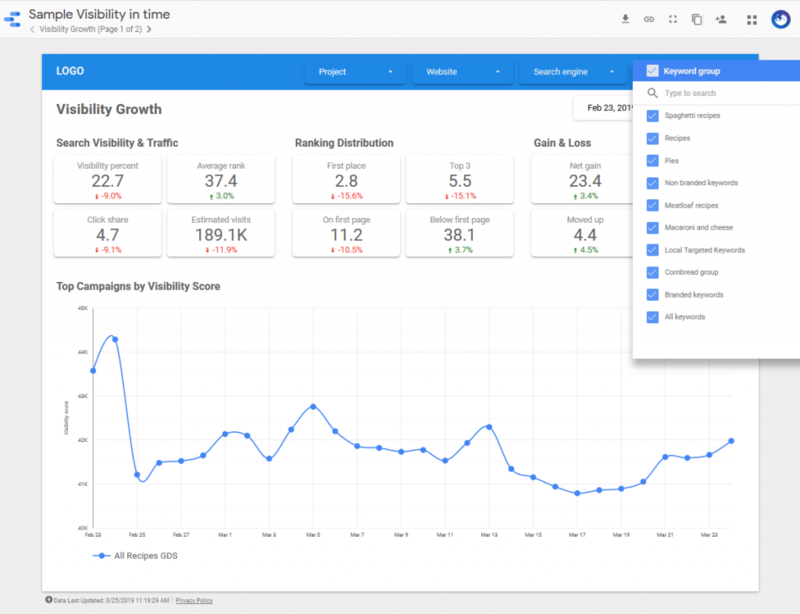 When setting up the widgets, you can choose from a large set of visibility metrics to upload, across multiple dimensions, depending on the type of reporting you are going after. The samples we built take data from one AWR project, with multiple websites, search engines and keyword groups that can be refined on-demand directly on the GDS side. You can find the complete list of metrics in the feature documentation page. As promised, here are the reports that were built together with our customers taking part in the User Test project. Note that the actual values shared below do not represent Customer Data. They are retrieved from an AWR test account. This report page was built by Steve Ollington, Search Engine Strategist Global Services at VMware. The focus is on the search visibility performance with positive vs. negative trends in time, for the keywords set monitored with AWR. The KPIs at the top sum up the values recorded for each ranking refresh that was performed across the time interval on the report, which are listed on the table below. The time interval can be changed in the report on-demand. When doing so, the AWR stats will be refreshed accordingly in a few seconds, up to a few minutes (depending on the amount of data to be processed for the new date range selected). 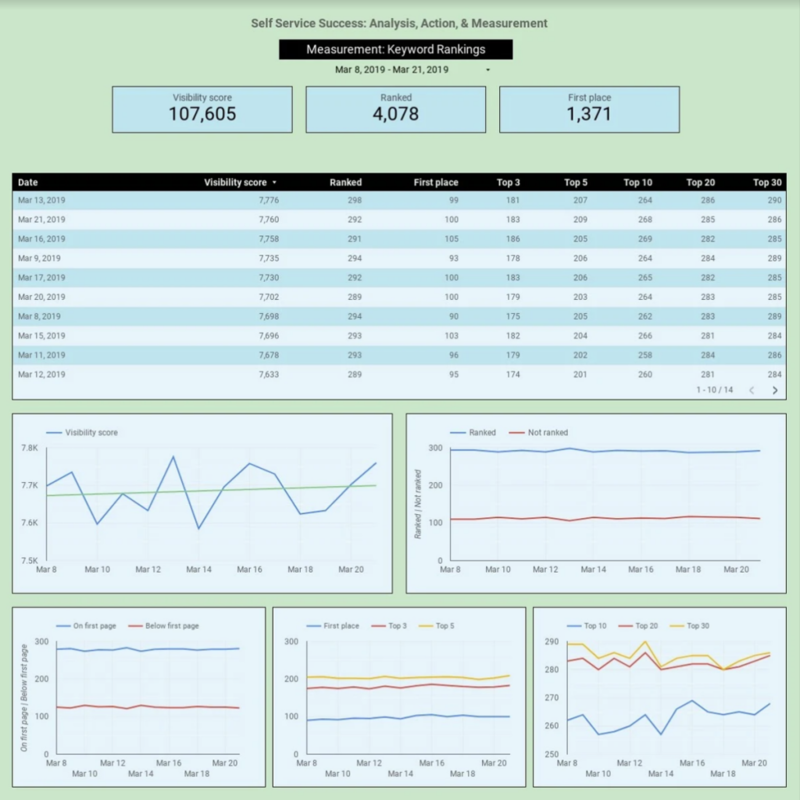 The full report that Steve has created includes KIPs and granular keyword & landing page data also from Google Analytics and Search Console, on separate pages. This report was built together with Bogdan Mitrache, Head of Product at Advanced Installer (our sister product). The keyword set that he is monitoring with AWR is organized in three main categories: All keywords, Competitor keywords (this includes all keywords for which competitor domains are listed in the search results, including their branded terms) and Common keywords (this is the intersection of advancedinstaller.com and the competitor ranked keywords). 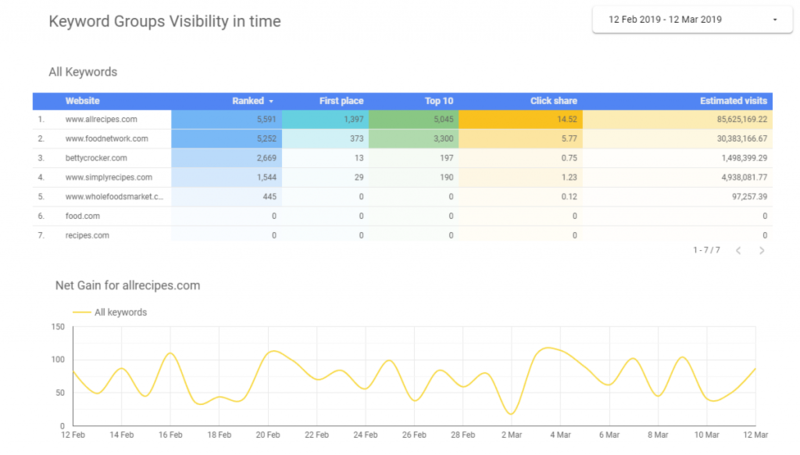 The focus on the report is on comparing the visibility and estimated traffic performance against the competitor, with split by keyword category. 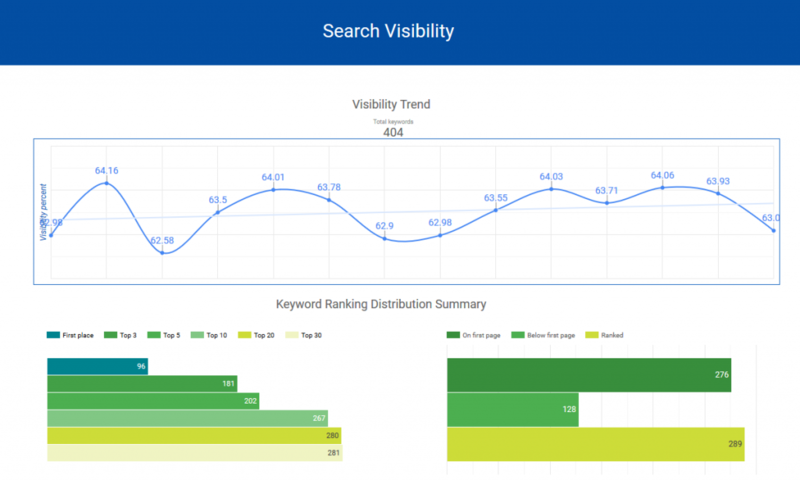 On each report page, the filters by search engine, website and keyword group are applied directly at widget level. This report page was built together with Syed Shehzad, Senior SEO Manager at the Bauer Media SEO Agency. The focus is on evaluating the rank distribution of the customer domain, to prove the effectiveness of the search engine optimization strategy. Basically, the bar charts quickly show how many keywords are of first position, top 3 – top 20, out of the total ranked keywords. 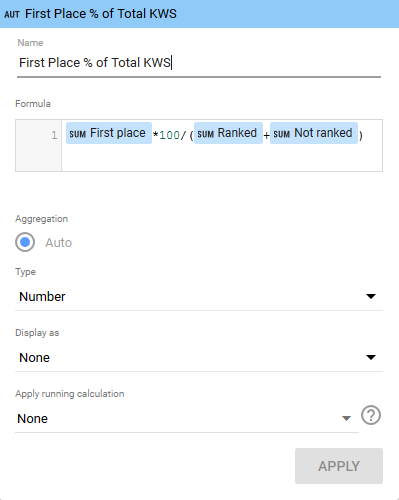 While AWR shows this information only as integer numbers, it can be displayed in GDS as number, or percent from the Ranked keywords, or from Total keywords tracked in the project. This is available with the help of the Calculated fields. That’s all for now. Thanks everyone who contributed for their help, it’s been an amazing experience to work together on the project! And hope you’ve found inspiration in these examples and you’ll be sharing your own report samples and feedback with us soon. If you’re new to AWR, sign up for a free 30 day trial and see how the new feature works with your own ranking data. 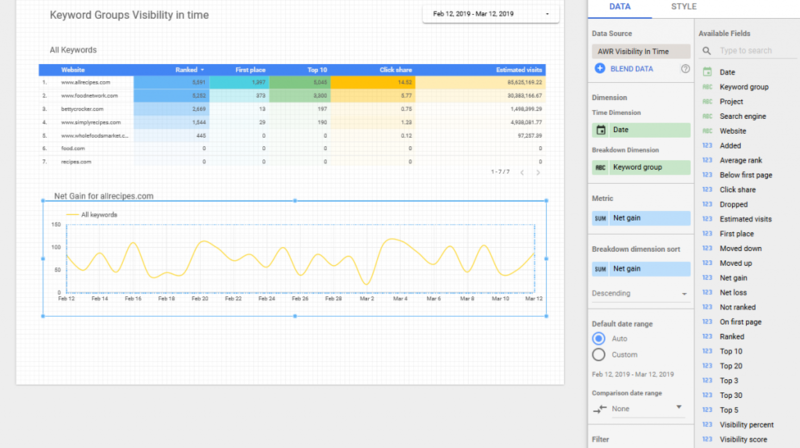 Love this new feature – as I’m a massive, massive fan of Google Data Studio. A bit tricky to setup at first, but you can get some nice visualisations from this.